Newcastle upon Tyne is five miles west of South Shields at the mouth of the river Tyne. If you are staying with us in South Shields you can reach Newcastle upon Tyne city centre via the Tyne & Wear Metro (light rail service), local bus routes and of course by car, motorbike or even bicycle. South Shields has a direct Metro route (yellow line) to and from Newcastle city centre and we would recommend this method as the quickest. Journey time to/from Newcastle upon Tyne city centre is approximately 20 minutes. Whilst South Shields is at the eastern end of the yellow Metro line Newcastle city centre encompasses Central, Monument and Haymarket Metro stations. The yellow line to/from South Shields stops at Central, Monument and Haymarket stations before continuing north to Jesmond and the coast in a loop before terminating at St James' Metro station (St James' Park, the home of Newcastle United Football Club). If you wish to travel between our guest house in South Shields and St James' Park then you can either disembark at Monument Metro station and walk 250m to the stadium or change lines at Monument Metro station. We do not recommend you travel around the whole yellow line loop to reach St James' Park from South Shields as this would take over an hour to do. A map of the Tyne & Wear Metro system is shown above. South Shields is on the right of the image, south of the river Tyne and our yellow line terminates at St. James'. Journey time to/from Newcastle city centre is approximately 20 minutes. 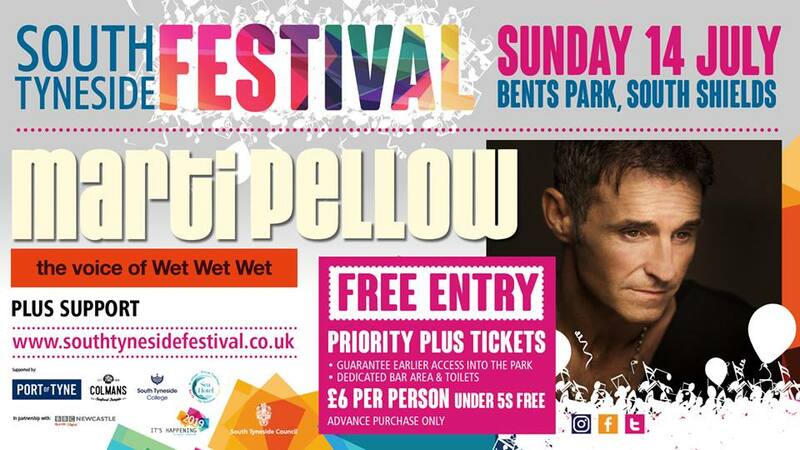 Further information including ticket prices and how to use the Metro can be found on this page of our website: Tyne and Wear Metro. 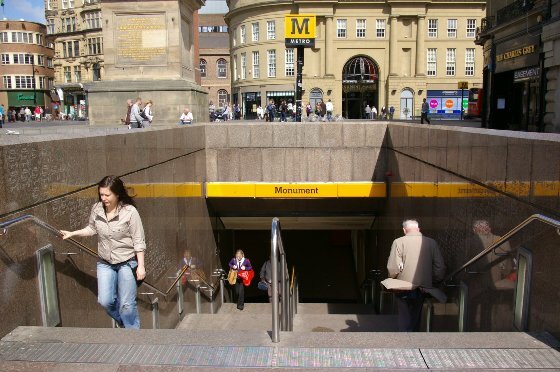 If you are travelling to Newcastle upon Tyne for shopping either in Eldon Square shopping centre or Grainger Street, Grey Street, Monument Mall or Northumberland Street then we recommend that you disembark at Monument Metro station. Monument Metro station has a choice of four exits - one is in the basement of Monument Mall itself. A second is on Blackett Street which is at located at the bottom of Northumberland Street (the exterior of Monument Mall shopping centre). A third station exit is within Eldon Square shopping centre and the fourth exit is at Grey's Monument which is at the top of both Grainger Street and Grey Street. Monument Metro station's Grey Street exit can be seen in the image above with the base of Grey's Monument and the Blackett Street entrance to Monument Mall in the background. Monument Metro station is also the closest Metro station for regional bus stations: Eldon Square bus station and Haymarket bus station. We recommend leaving the station via either the Grey's Monument exit or the Blackett Street exit for the short walk west (along Blackett Street) to both these bus stations. 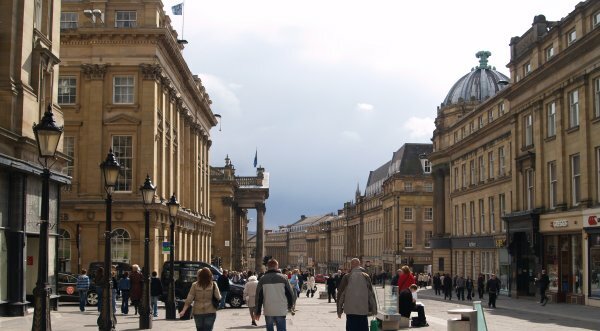 Newcastle upon Tyne has several museums in the city centre, all are close to Metro stations that also serve South Shields via the yellow line. If you are planning to visit the Discovery Museum on Blandford Square, Newcastle upon Tyne, NE1 4JA then the closest Metro station is Central. Similarly the Centre For Life aka Life Science Centre on Times Square, Newcastle upon Tyne, NE1 4EP is adjacent to Newcastle Central Station on Neville Street (regional and national trains) and the Central stop of the Tyne and Wear Metro. Stephenson's Works at 20 South Street, Newcastle upon Tyne, NE1 3PE is also a short distance from the Central Station Metro stop along with Bessie Surtees House at 41-44 Sandhill, Newcastle upon Tyne, NE1 3JF. The closest Metro station for The Laing Art Gallery on New Bridge Street, Newcastle upon Tyne, NE1 8AG is Monument (Blackett Street exit is recommended). Both Trinity House and the Trinity Maritime Centre at 31 Broad Chare, Newcastle upon Tyne, NE1 3DQ are closest to Central Station Metro station (we recommend leaving the Metro station via the Grainger Street exit). Haymarket Metro station is the closest to Great North Museum: Hancock aka Hancock Museum at Barras Bridge, Newcastle upon Tyne, NE2 4PT. 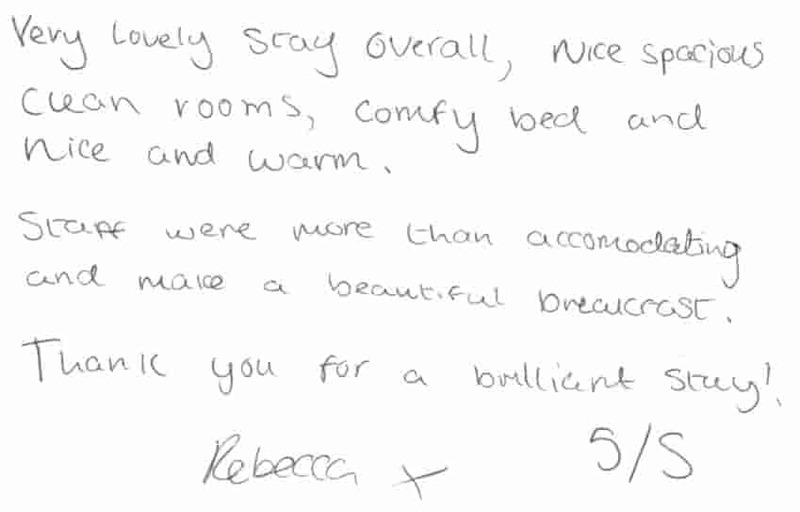 It is also the closet Metro station for guests wishing to visit Newcastle University and Northumbria University.